The annual Bo Sang Umbrella and Sankampang Handicrafts Festival celebrates and recognises the community that creates Thailand’s most famous umbrellas handmade from Saa, or mulberry bark, paper. 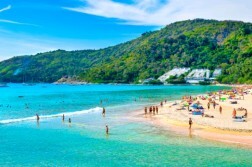 This year the event takes place from 19 to 21 January, 2018. Legend has it that a monk travelled to neighbouring Myanmar, where he came across unique umbrellas made from Saa paper that offered protection against both the sun and rain. He returned with the production technique and introduced the umbrella to the elders of Bo Sang village, who added their own artistic skills to create a distinctive colourful, but very practical, umbrella. At first it was just a profitable hobby that supplemented the villagers’ earnings from the annual rice crop. 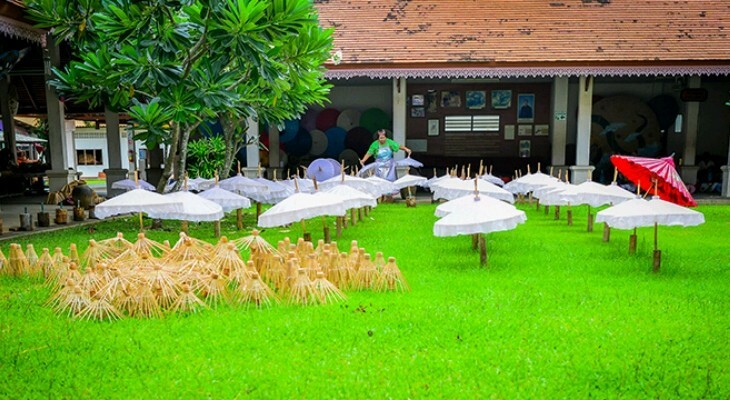 However, with time production of the Saa paper umbrellas prospered, prompting villagers to establish a handicraft cooperative in 1941 that now organises the annual Bo Sang Umbrella and Sankampaeng Handicrafts Festival. To-date, Bo Sang umbrellas are made from three types of different materials, including Saa paper, silk and cotton. During the three-day festival, streets are illuminated by lanterns, while hundreds of umbrellas are hung from the rafters and beams of houses and shops. Bands play, while villagers compete to design the year’s most attractive umbrella. The ‘Bo Sang Beauty Pageant Bike Parade’ presents beautiful ladies with an umbrella in one hand riding a bike with another. 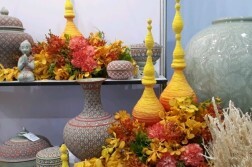 Concerts and a food festival, all compete for the attention of the audience, a mix of both tourists and residents, who gather to celebrate Bo Sang’s innovative handicraft skills.